White Bass Campaign 2019 - Lake Houston Fishing! Lets get some reports going . I am going out this morning for a shot at some. Sunday was a bust with that rain Sat night. Was out on Sunday. Water was still pretty mudding. Hope it starts clearing up some. 16 today ALL over I did not catch more than 2 in any spot, water looked real good too. Went up to peach/caney split and drifted down. Headed out in hour or so, checked flow levels and it should be a good day, we will see! Saw JigNJim at mouth of Dunham, but I see them EVERYTIME i go out !! I also saw what I thought was a wolf yesterday about a mile up in Caney, near where those sandpits are on the W bank there. It was darkish gray, about 50-60lbs, short ears, non bushy tail with some black spots or splotches. I saw one deceased, exact same description Monday morning headed to work on 99 near San Jac river. I wish I had got a pic but I was cruising by at a good clip and dont like to stop up there with all the sandbars. thanks for the report Kisndismis. and leave me and Sk piles alone. Once again they were scattered. I drifted from the split talking to another boat and we worked both sides of the bank good mile or so down and had a handful, all males. Nice to be out though, tried some minners over a pile for a bit and drowned them! 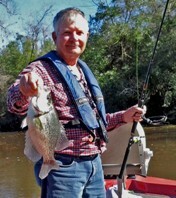 So the white bass still strong in caney creek. I have the perfect bait for them. They are usually strong way up luces bayou also.